Aston Martin Lagonda has revealed the final production-ready iteration of its first all-electric production car, with the Rapide E making its world debut at China’s Shanghai Motor Show. Unveiled by Aston Martin executive vice-president and chief creative officer, Marek Reichman, Rapide E is a pivotal model for the luxury marque. 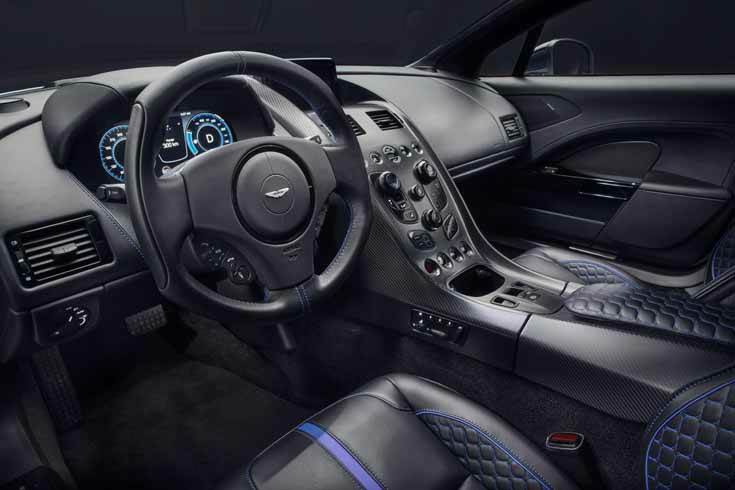 Following the success of previous special-edition models, including Aston Martin Vulcan, the Vanquish Zagato family and DB4 GT Continuation, Rapide E aims to deliver a superior level of performance, craftmanship and exclusivity, while also propelling Aston Martin into the all-electric realm. The first car to be built at Aston Martin’s state-of-the-art St Athan production facility – the brand’s electrification factory – the Rapide E represents a pioneering first step towards achieving the company’s wider electrification strategy and the successful fruition of Lagonda – the world’s first zero-emission luxury brand. A special edition with a production run strictly limited to 155 units, Rapide E has been developed in collaboration with Williams Advanced Engineering (WAE). Shown for the first time here in Shanghai today, Aston Martin’s design and engineering teams have worked in partnership to extract the optimal aerodynamic performance. Traditional metal vanes give way to a striking honeycomb front grille. With lower cooling requirements demanded of the EV powertrain, Aston Martin’s aerodynamic engineers have optimised the aperture of the frontal area, minimising airflow through the car’s body, improving the car’s aerodynamic efficiency and increasing range as a result. Inside and out, Rapide E is equipped with the materials and technology befitting of the marque’s first EV model. Gone are the analogue displays of the past. A 10-inch digital display now sits in their place, delivering all key information to the driver while on the move, including the battery’s state of charge, current motor power levels, regenerative performance and a real-time energy consumption meter. Swathes of carbon fibre have been deployed throughout, assisting in delivering the strict weight targets set by Aston Martin’s engineering team from the outset. Meanwhile, a dedicated app allows key information from the car to be remotely monitored. This powerful dashboard displays remaining range, battery status, and time to charge, as well as allowing navigation destinations to be sent from the app to the car for easy route planning. The car’s parking spot can also be seen via the app, with walking directions provided to help re-locate it in busy locations. Finally, the health and status of Rapide E can also be tracked from the app, providing reminders such as when a key service is due. The Rapide E is powered by an 800V electrical architecture battery – encased in carbon fibre and Kevlar casing – with a 65kWh installed capacity using over 5600 lithium-ion 18650 format cylindrical cells. 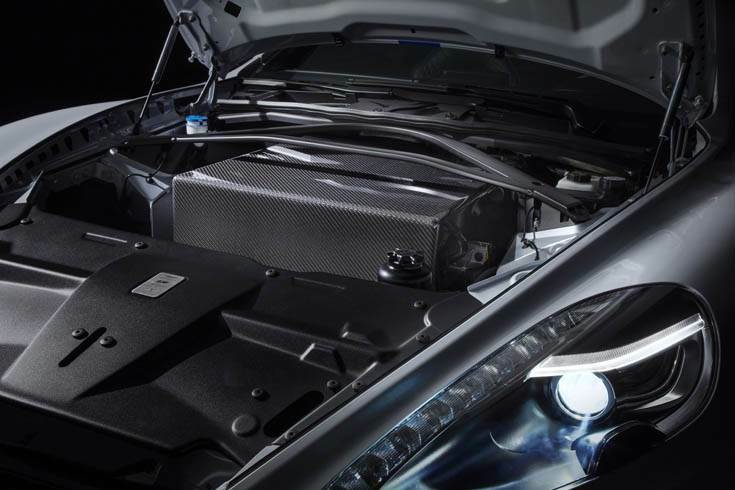 This bespoke battery pack lies where the original 6.0-litre V12, gearbox and fuel tank were located, with the 800V system allowing for more efficient charging and greatly improved thermal characteristics over existing electrical architectures. This battery system powers two rear mounted electric motors producing a combined target output of just over 610PS and a colossal 950Nm of torque. The Rapide E’s range is over 200 miles / 320km under the Worldwide Harmonised Light Vehicle Test Procedure (WLTP), while the model is capable of charging at a rate of 185 miles of range per hour using a typical 400V 50kW charger. However, the car’s 800V high-voltage battery system enables faster charging of 310 miles of range per hour, using an 800V outlet delivering 100kW or higher. For destination charging, the car also features an industry-leading high-power AC on-board charger capable of recharging the battery in as little as 3 hours. The Rapid E has a top speed of 155mph/254kph, with a sub-4.0 second 0-100kph time. The eco-friendly speedster also enhances the feel, character and delivery of the V12-engined recently acclaimed Rapide AMR, thanks to careful attention paid to the tuning of both the electric powertrain and the chassis across three driving modes – GT, Sport and Sport + – which are selected for both the powertrain and handling. 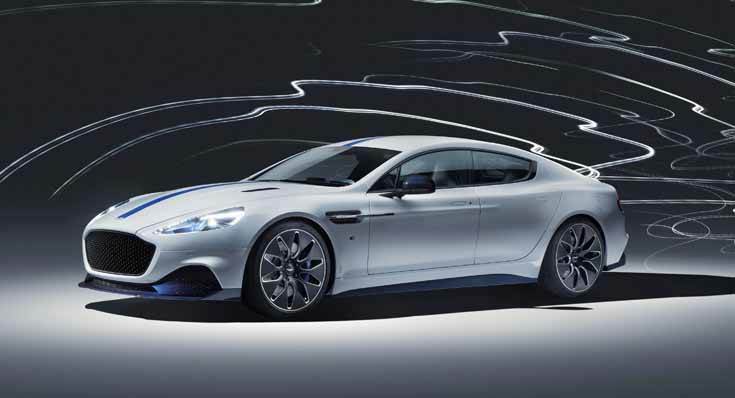 The rear-wheel drive Rapide E’s twin electric motors drive through a Limited-Slip Differential, which combined with a revised spring and damper rates, ensures the pure handling characteristics of the petrol-powered Rapide AMR are retained.